Not all dryer sheets should go in the washer. Some dryer sheets will not be effective unless exposed to heat, such as that in a dryer. However, specific brands, with specific ingredients, of dryer sheets will work if put in the washer and transferred, along with the clothes, to the dryer. These sheets act as both detergent and dryer sheet by both washing clothes and preventing static cling and softening fabric. Sort laundry by color and washing instructions on the tags of clothes and other washable items. Load the washer with one group of washable items, setting the water temperature and wash intensity (such as "Gentle," "Regular," or "Heavy"). Drop a dryer sheet into the washer. 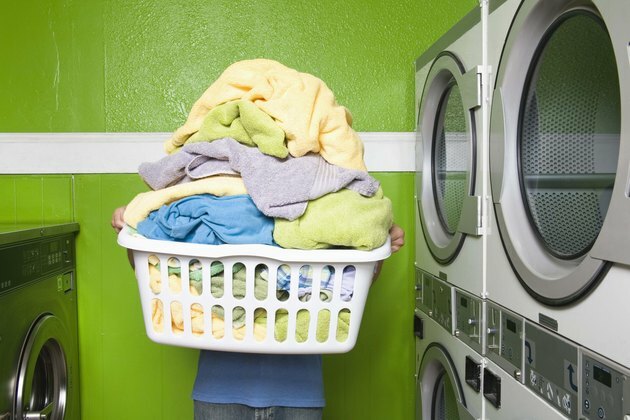 Do not add any detergent or fabric softener besides the sheet--the sheet is both detergent and fabric softener. Transfer the clothes, along with the dryer sheet, into the dryer. Start the dryer. Most brands of this type of dryer sheet release substances that inhibit static cling and soften fabric once the dryer starts. Do not add another dryer sheet or any other fabric softener.